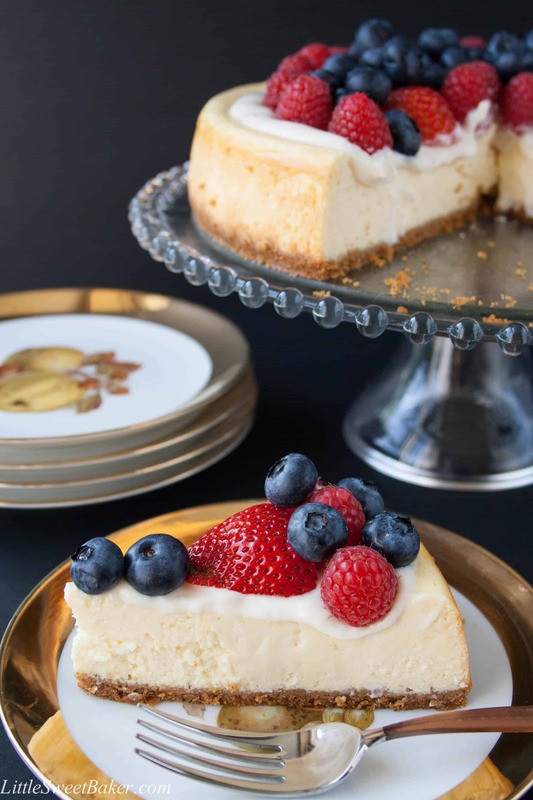 CHEESECAKE 101: Everything you need to know about how to make a simple and delicious cheesecake, and how to create your own variations. Cheesecake is one of the most beloved dessert around the world. 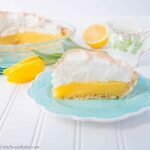 With so many variations to suit your taste buds, I can certainly see why this heavenly dessert is so popular. This is my first recipe and tutorial post, so something new for me. 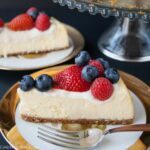 My goal is to show you how easy it is to create your own cheesecake recipe by first demonstrating how to make a simple cheesecake and then how to create your own variations. 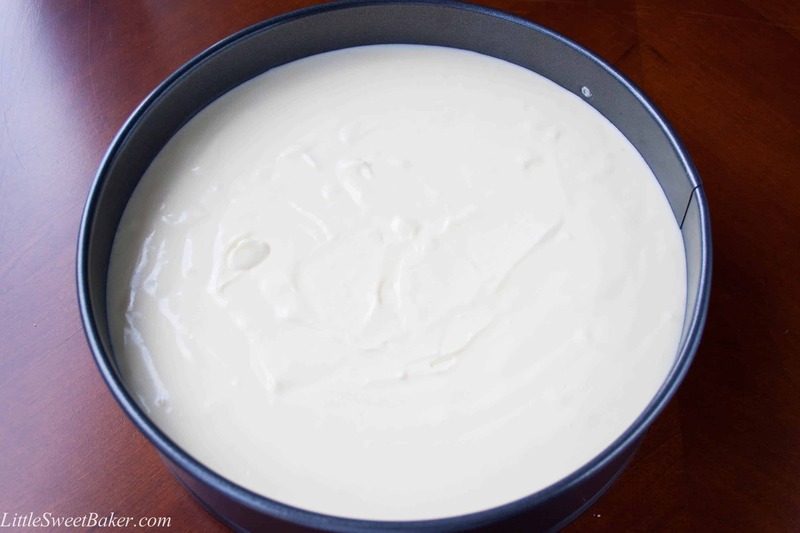 The basic recipe I’ll be sharing is a simple cream cheese based recipe with sour cream. It has a smooth, velvety texture and creamy vanilla taste with the perfect balance of sweetness. I don’t fuss with twice-baking and I don’t fuss with a water bath, I just keep it simple and amazingly delicious. 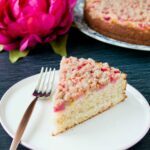 If you’re just interested in the recipe for the cheesecake you see in the photos, please scroll to the end of this post. So, let’s start with the baking temperature. The general rule is 325°F for a dark non-stick springform pan, and 350°F for a silver springform pan. I prefer to bake at 325°F. It takes a bit longer, but I find it bakes more evenly. My recipe is also based on a 9″ springform pan because it’s the most common size. To make the crust, mix 1 to 1&1/2 cups of graham cracker crumbs with 3-4 tbsp of melted butter, depending on how thick you want it to be. My recipe ratio is 1 pkg (250g/8oz) of cream cheese to 1 large egg to 1/4 cup sugar to 1/4 cup sour cream. 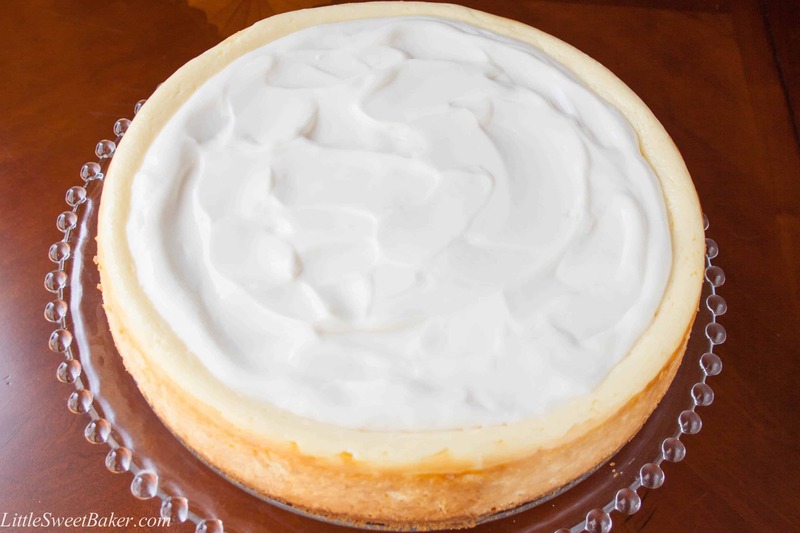 So, for a small/thin cheesecake, I would use 2 pkgs of cream cheese, 2 eggs, 1/2 cup sugar, and 1/2 cup sour cream. For a medium size, which is what I made in the pictures, I used 3 pkgs of cream cheese, 3 eggs, 3/4 cup sugar, and 3/4 cup sour cream. 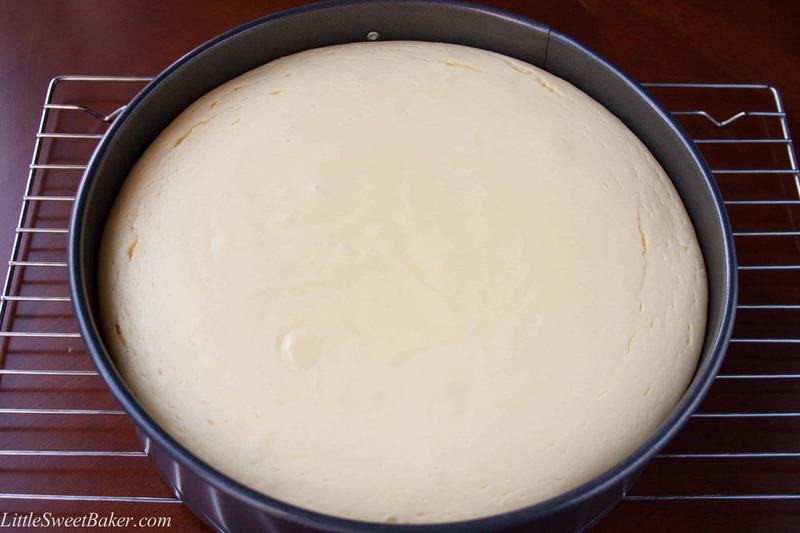 For an extra large/thick cheesecake, use 5 pkgs of cream cheese, 5 eggs, 1&1/4 cups sugar, and 1&1/4 cups sour cream. Easy math right? All ingredients should be at room temperature. Start by mixing the cream cheese and sugar until combined, add eggs, one at a time, then add the sour cream and mix until smooth. Baking time is generally 40-50 minutes for a small, 50-60 minutes for a medium, 1 hour – 1hour & 10 minutes for a large, and 1hour & 10 minutes – 1hour & 20 minutes for an extra large/thick cheesecake. Approximately 10 minutes extra per pkg of cream cheese. 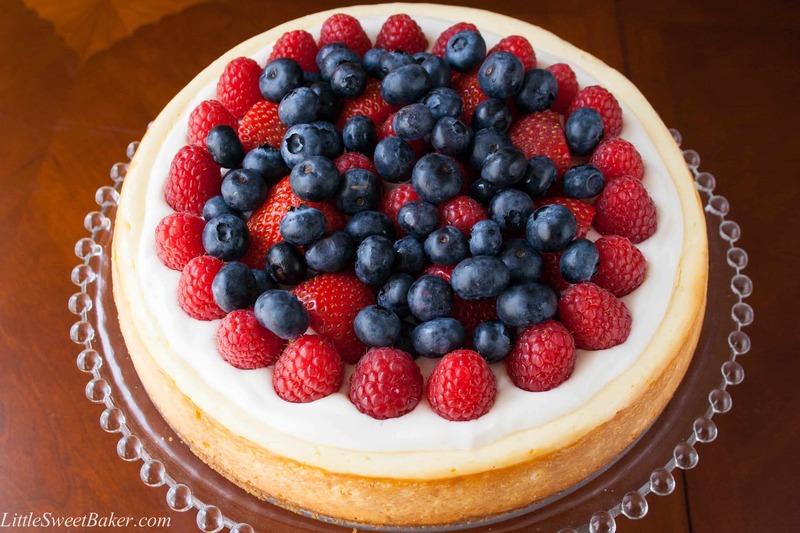 Now, let’s get creative and go through some ideas on how-to customize your cheesecake. Crust: You can use any kind of cookie or cracker crumbs. My favorites are Oreos, honey graham crackers and gingersnap cookies. Add some lemon zest, or spices for more flavor. Add some finely chopped nuts for some crunch. Filling: Melt some semi-sweet chocolate or white chocolate into the batter (about 2 oz per pkg of cream cheese). Add some citrus zest, flavored liquor, vanilla extract, spices or extract of any flavor. Swirl some jam into the batter. You can also omit the sour cream if you want a firmer cheesecake or replace it with ricotta cheese, coconut cream, or canned pumpkin if you like. Topping: I always top my cheesecake because I think it makes it look prettier and adds flavor. My favorite is what you see in the pictures, sweetened sour cream and beautiful fresh fruit. You can top your cheesecake with anything you like or have on hand. Some ideas are whipped cream, jam, chocolate ganache, caramel sauce, pie filling, chopped up candy bars etc. You get the idea. So, I hope you found this post helpful. Let me know what kind of recipe you come up with and email me some pictures. I can’t wait to see what you create! 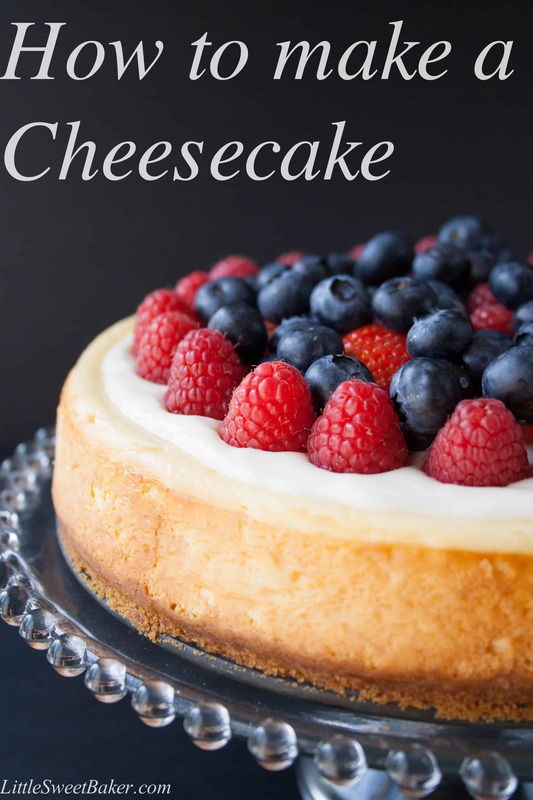 This is an easy basic cheesecake recipe that you can adapt any way you like. Preheat oven to 325°F. 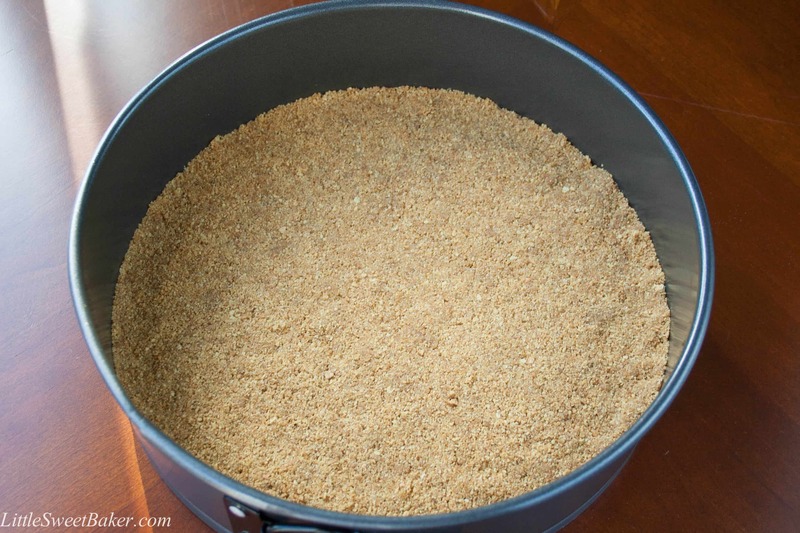 Mix the graham cracker crumbs together with the melted butter and press onto the bottom of a 9″ springform pan. Using a handheld mixer, blend cream cheese and sugar until combined. Add eggs, one at a time, mixing in between. Then add sour cream and blend until smooth. Pour over crust and bake for 50-60 minutes or until edges are lightly brown and center is almost set. Run a thin knife around the edges and let cool completely before topping or refrigerating. Whisk sour cream with powdered sugar and vanilla until smooth. 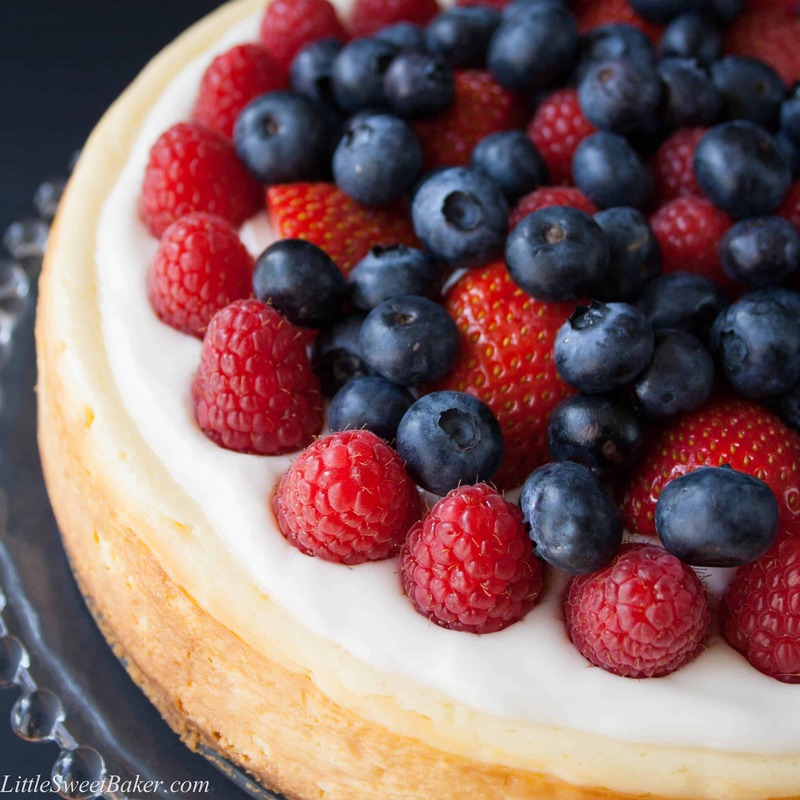 Spread on top of cheesecake and decorate with fresh fruit before serving. Cheesecake is best when chilled for at least 4 hours or overnight. This was awesome! I received several compliments from co-workers. I have never baked a cheesecake before so I was really nervous. Great recipe! Thank you, Johnna! I’m thrilled to hear it was such a great success. I hope you try some more of my recipes, and have a happy New Year! This is super helpful! I baked a cheesecake using this guide for my family the other day and it was a huge success! Thank you very much! Oops, forgot to mention that I will also have to use almond flour instead of graham cracker crumbs for the crust. Almond meal might work a bit better because the texture is more similar to graham cracker crumbs than almond flour. As for the sugar substitute, let me know what you are thinking of using just in case there is any slight adjustments needed. Thank you for your comment and have a great week! Hi Lily, Actually, almond meal is what I have – I miss-spoke there. I am planning to use a combination of Splenda & Swerve as sweeteners. We are new to Keto and I only know what I have read on the internet. I understand that Swerve doesn’t spike your blood sugar, but it’s more expensive than Splenda. In combination, I was hoping to make the Swerve last longer and to lessen the rise in blood sugar that Splenda causes. They both taste very close to sugar to me. Also, I’d like to make a lemon cheesecake for our older son’s birthday in a couple of months. Very lemony. I will of course use zest, but how much lemon juice can I safely add to the batter in the next-to-the-largest size cheesecake? I would appreciate your thoughts on both the sweeteners and the lemon cheesecake. Love your site and will definitely be trying to adapt some of them to Keto. They are inspiring! Thank you! Splenda and Swerve should work fine in a cheesecake. I just wanted to make sure you were’t using a liquid sweetener that would thin out the batter too much. To make a lemon cheesecake, you only need 1/4 cup of lemon juice because the flavor will mainly come from the lemon zest. If you want to make it very lemony, I would add in 1 tbsp of lemon zest. I hope that helps and feel free to email me again if you have any other questions. Enjoy and have a lovely week! Thank you Lily, I will follow your suggestions. I plan on baking a small one for my husband & myself next week ……if I can wait that long! I’ll let you know how it turns out. Lily! Thank you so much! This is just what I was looking for….. ingredient ratios for a basic cheesecake! Beautifully simple, straightforward instructions along with hints & tips to make a perfect cheesecake! My husband & I are trying very hard to keep our meals Ketogenic. Need I say that occasionally we really, really crave a dessert that tastes like those we were used to? This cheesecake is a great answer, as all I have to do is change out the sugar for an approved substitute. 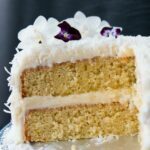 I just haven;t found a recipe that I truly love, but I cannot wait to try this one and will be back to rate it as soon as I’ve made it! Wonderful dessert when the family comes to dinner. We/ll get our sweet fix and when everyone is gone, the cheesecake will be too …..no OVER -indulgence! I was going to try the extra large cheesecake with out sour cream in a 9” spring pan. Do you think it will over flow over the pan? I don’t think so, but depending on the height of your pan, I would only fill up to 1 centimeter from the top of the pan. I hope that helps and feel free to email me back if you have any other questions. Enjoy and have a great day! Ok great I am going to try it. Thank you for responding so quickly!!! Hi. I was meaning to make a mango cheesecake. Can I replace the sour cream with mango puree? If yes, do I replace it with the same amount? Thanks for ratio breakdown. Thank you for the wonderful recipe! It turned out beautifully. I followed the recipe exactly but only added a little vanilla extract, lemon juice, and zest. The flavor was delicate and the texture was perfect. This will be my go-to cheesecake recipe. Thanks for the ratios too! You’re very welcome Whitney and thank you for your lovely feedback. Enjoy and have a great day! What’s your usual ratio for sour cream- sugar topping? As per recipe, 3/4 cup sour cream, 1/4 cup powdered sugar, 1/2 tsp vanilla. Enjoy! You put sour cream topping and immediately berries? It came out delicious as usual, but for some reason had issues slicing it. Not that it prevented anyone from eating it. Still I wish I could do better serving it! I see… Also I used your advice from the general cheesecake post and made it bigger. Maybe that messed with cutting or maybe I over baked. Anyway will still keep making it. The taste is soo worth it! Hi this looks lovely! Can i use heavy cream instead of sour cream? Hello! I was wanting to make mini Oreo cheesecakes with this recipe, would the bake time still be the same? Could you please tell me how many grams of cream cheese you use? The packets of cream cheese seem to differ in size. Hi Memoona, I’m glad you have found your passion at such a young age. Can you tell me what goes wrong when you try to make a cheesecake? That way, I can better answer you question. Thanks and I look forward to hearing back from you. Hi Memoona, sounds like perhaps there wasn’t enough butter to hold biscuit base together. As for the top, I’m not sure. Perfect. I was looking for the ratio /technical aspect behind it. Do you know what makes the cheesecake to rise? OR does it. My cheesecake came out very flat / Also had to do with the fact, I used only about 400gms of cream cheese in a 7in springform. Perhaps I should use 600gms-900gms to get a taller cheesecake. it looks like a perfect cheesecake!